Mark Dziewulski has been commissioned to build several international large scale public art projects in the US, Europe and Asia. This group of work includes an aerodynamically inspired sculpture at the Warsaw national war memorial, for which the Republic of Poland presented him with a medal, the Gold Cross Order of Merit and which received endorsement from Buckingham Palace; Dancing Ribbons, Asia’s largest indoor sculpture (Hong Kong); and a monumental colorful outdoor glass ocularly inspired sculpture for the Dean McGee Eye Institute (Oklahoma City). "A magnificent monument to the Polish airmen" — Aleksander Kwasniewki, President of Poland. This is the national memorial to the Polish airmen who fell during World War II. The sculpture is intended to express the pilots’ inspiring passion for freedom, their courage and their faith in their eventual success. The glass and steel sculpture creates a visual landmark expressing the sense of optimism and hope provided by the Institute. It provides a gateway and symbol for the campus. The design is an abstract representation of vision. It is based on a stylized form used to represent the human eye, that is found as far back as Mesopotamian art, later refined and stylized in Egyptian hieroglyphs and engraving, and is still used today. This abstraction of a figurative motif is now universally recognized as a symbol for sight and vision. The design also goes further because it uses the basis of vision – light and its refraction into the color spectrum. It uses color and natural light as a metaphor connecting nature and artifice. The colored glass reflects and transmits light, casting fragments of colored patterns around it and reflecting sunlight sparkles. Asia's largest indoor sculpture. 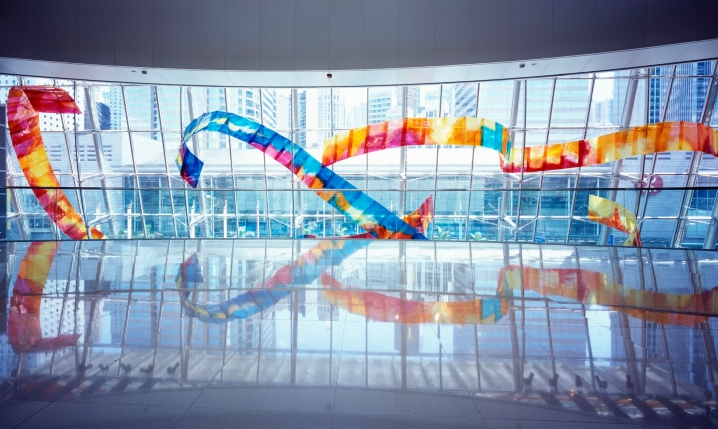 Inspired by Chinese ribbon dancing, as well as the universal use of dancing ribbons, flags and banners to greet visitors, this glass suspension sculpture has a long history that crosses the boundaries of language, culture and geography. By daylight the colors wash naturally across the space, changing subtly with the movement of the sun. By evening internal lighting casts a night time glow. 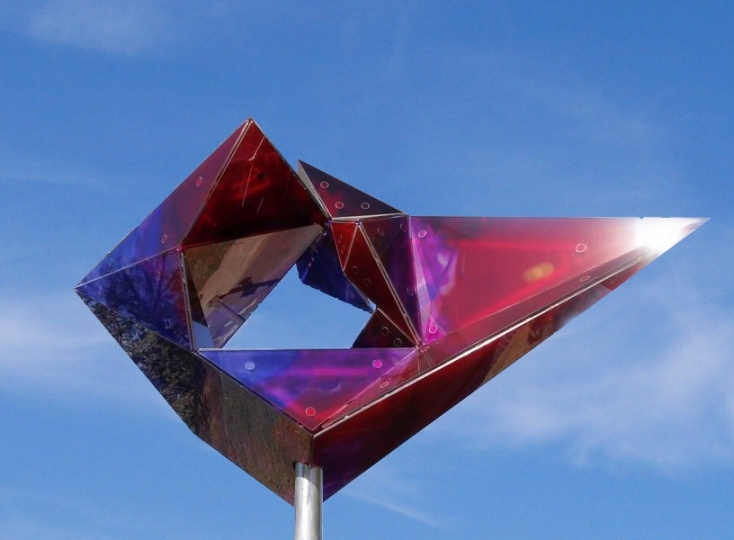 The sculpture is intended to visually stimulate viewers from all perspectives. Greater levels of detail unfold and change as the viewer moves through the space changing distance and viewing angle. The project was carried out with partnering artist, Shan Shan Sheng.